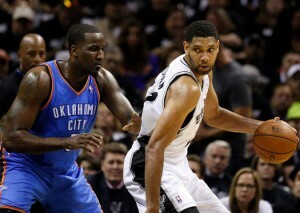 For the first time in seven seasons, the Oklahoma City Thunder are in search of a new head coach. 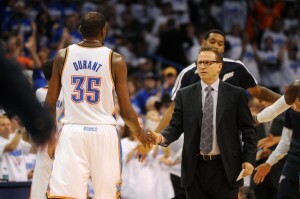 Since their arrival in 2008, the Thunder have always had a head coach in place. PJ Carlesimo started as the head coach for the Thunder in 2008, but after beginning OKC’s inaugural season 1-13, Carlesimo was let go in favor of assistant coach Scott Brooks. Though he initially started with an interim tag, Brooks quickly shed that tag after finishing the last 50 games of that season with a 20-30 mark. 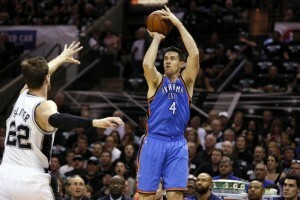 In the next 6 seasons, Brooks led the Thunder to 1 Finals appearance and 3 Western Conference Finals appearances. He was awarded the 2010 NBA Coach of the Year award, and was the coach behind James Harden’s 2012 6th Man of the Year award and Kevin Durant’s 2014 MVP award. But as successful as he was in developing top-notch talent, he was just as lacking in a lot of the coaching aspect of coaching. His offense was very simplistic, but the coup de gras may have been is inability/stubbornness to change on the fly, in-game. With that in mind, the organization decided that Brooks had likely hit his glass ceiling with this team and parted ways with him. No separation is ever without tension. But this one seems to be amicable on both sides. 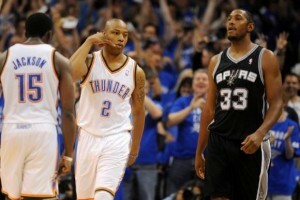 The Thunder, and Brooks, himself, did not want to go into this next season with the lame-duck status over their heads. With Durant’s impending free agency quickly approaching, any misstep or change in-season could be seen as a desperation move. The organization decided that if a change was going to be made, it had to be now, so that there is some consistency heading into the season. With that said, this becomes the first ever head coaching search in the history of the Oklahoma City Thunder. As soon as Brooks’ departure was announced, several names were dropped as potential candidates for the now vacant head coaching job. With Durant, Russell Westbrook, and Serge Ibaka currently in tow, this is likely one of the more desirable jobs for a head coach. Here are 10 possible candidates for the Thunder’s head coach gig. Rex Kalamian – Kalamian has been one of Brooks’ top assistants for the past 5 seasons. He has overseen the development of the Thunder’s players and has also been the coach of the Thunder’s summer league team the last 3 seasons, winning the Orlando Summer League in 2013. Kalamian has been an NBA coaching lifer, starting as scouting assistant with the Los Angeles Clippers in 1992, and moving onto to stints with the Philadelphia 76ers, Denver Nuggets, Minnesota Timberwolves, and Sacramento Kings, before settling into his current position with the Thunder. He appears to have a great rapport with the players and a hiring like this would lessen the blow of the coaching change. 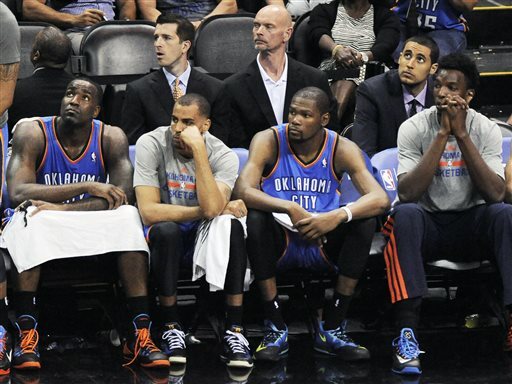 Troy Weaver – The Thunder’s current vice president/assistant general manager also has an extensive coaching portfolio. He started by coaching AAU ball in the Washington D.C. area from about 1992-1996. He went on to be an assistant coach at the University of Pittsburgh, University of New Mexico, and then onto Syracuse University, where he is credited with recruiting Carmelo Anthony to the school. In 2004, he became the head scout for the Utah Jazz. Later he promoted to director of player personnel in 2007, and held that post through the end of the 2008 season. He was then hired by the Thunder in his current position, where he assists with roster building (NBA Draft preparation and free agency) and day to day basketball operations. 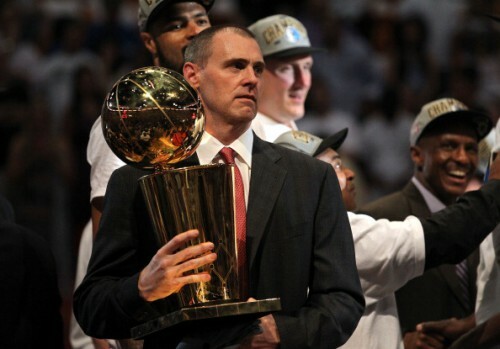 Remember, the Spurs, whom the Thunder tend to emulate, once hired their general manager as their coach and went on to win 5 championships in a 16 year period. 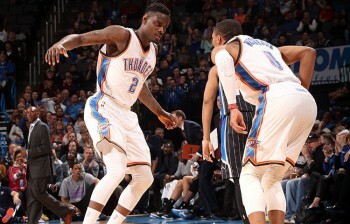 Billy Donovan – The current University of Florida coach has a good relationship with Thunder GM Sam Presti, who hired two of Donovan’s assistants in the past year (Mark Daigneault as the coach of Oklahoma City’s Development League team and Oliver Winterbone as a basketball information analyst). Donovan currently boasts a 467-186 record at Florida, leading the Gators to consecutive national championships in 2006 and 2007. He has been named SEC Coach of the Year in three of the last 5 seasons. He has a reputation as a great player developer and values depth on the offensive end and toughness on the defensive end. 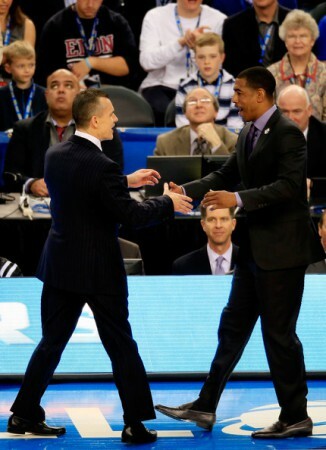 Kevin Ollie – The current UCONN coach has a history with the Thunder that can still be felt today. 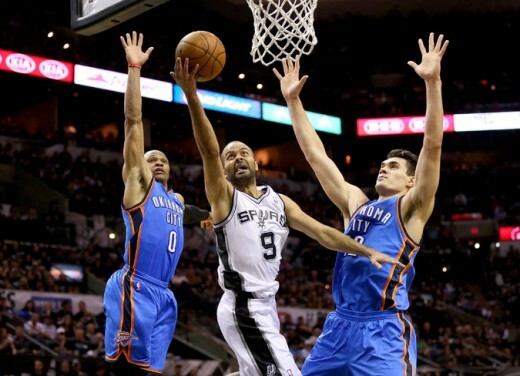 Ollie played his final season in the NBA with the Thunder and was sited as the veteran that taught Kevin Durant and Russell Westbrook how to be men in the NBA. 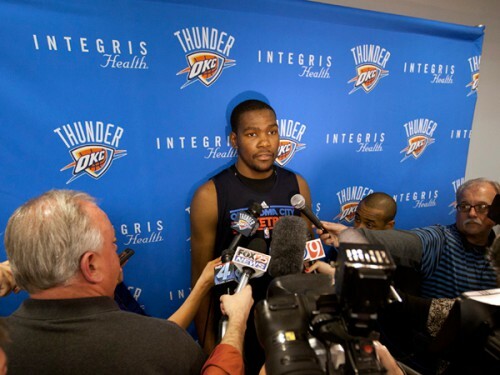 Durant even notes him as being the purveyor of the current culture that is the Thunder. After retiring from the NBA in 2010, he went on to be an assistant coach under Jim Calhoun at Connecticut. After two seasons, he took over for Calhoun and went on to win the 2014 NCAA Championship. According to various media outlets, Ollie has removed his name from consideration for the Oklahoma City job. Fred Hoiberg – The Iowa State coach is one of the hottest commodities in current coaching circles. His innovative, almost Spursian-like offense, made the Cyclones one of the top scoring teams in the NCAA’s throughout his coaching tenure. Players to come out of Hoiberg’s system are usually jack of all trades that are good at all aspects of the game, but not great at any one thing. In his 5 seasons in Ames, he has amassed a 115-56 record. 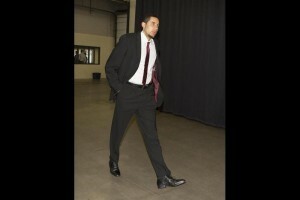 He also has professional experience, as he worked in the Minnesota Timberwolves’ front office from 2007-2010. Tom Thibodeau – The current Chicago Bulls coach is known as one of the best defensive minds in the game. Before working in Chicago, he was one of the top assistants in the league from 1989-2010. The work he has done with the Bulls the past few injury-racked seasons has proven his worth as a coach that is able to excel, even in difficult situations. The Bulls’ coach has amassed a 255-139 record in his 5 seasons in Chicago. The knock on Thibodeau has always been the amount of time he plays his main players and his lack of player development/depth. That may come into play with the Thunder’s top players suffering from injuries in the past few seasons. Various media outlets have reported that Thibodeau may be on his way out in Chicago, regardless of where they finish this season. Alvin Gentry – Gentry is currently the associate head coach for the Golden State Warriors, serving under head coach Steve Kerr. His “Spursian/Phoenix Suns 7 second or less hybrid” offense has worked wonders for the Warriors. Gentry is currently one of the highest paid assistants in the league. In his career, Gentry has gone 335-370 in previous stints with Miami, Detroit, the Clippers, and Phoenix. Rick Carlise – While there is nothing that points to Dallas letting go of Carlisle, his frustration over the Rajon Rondo situation may boil over in the offseason, especially if the Mavericks don’t get out of the first round. Carlisle will be heading into the final year of his contract next season. If the team or Carlisle don’t see eye to eye on the future direction of the team in the offseason, I could definitely see a Scott Brooks situation where Carlisle walks away from the final year of his contract to go to another team with a guaranteed long-term deal. Carlisle has amassed a 619-431 record in his 13 years of coaching with Detroit, Indiana, and Dallas. He won a championship with Dallas in 2011. 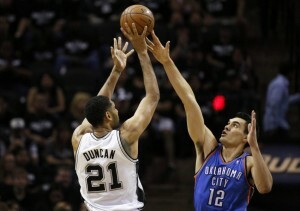 Chip Engelland – The Spurs assistant is credited with honing the shots of many Spurs’ players. He is known as the top shooting specialist in the league, and has built his portfolio up as an assistant in the past decade around the league. 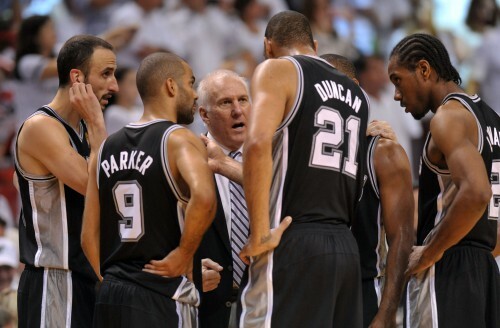 He has a reputation for developing a great rapport with his players and is routinely tasked with monitoring the Spurs’ players training/shooting regiments in the offseason. Ettore Messina – Before being hired on by the Spurs as an assistant coach, Messina was the top European coach in basketball. He led two Euroleague teams (Virtus Bologna and CSKA Moscow) to two championship apiece and was twice named Euroleague Coach of Year in 2006 and 2008. Messina is revered in basketball circles as a great basketball mind, almost like a European Larry Brown. Messina’s coaching philosophy fits in line with the Spurs’ model of floor balance and ball movement. He loves to balance the floor to keep the defense moving, especially with post-ups. With the Thunder’s recent acquisition (and hopeful re-signing) of Enes Kanter, they now have an interior scorer that could completely balance the floor in a Messian-run offense. Jeff Van Gundy – Anytime a good coaching vacancy opens up, Jeff Van Gundy’s name is always brought up. The former Knicks’ and Rockets’ coach has been out of coaching for the past 8 years, and while he has never said that he is interested in coaching again, he’s never said he isn’t interested in coaching again. Van Gundy amassed a 430-318 record in his 11 seasons of coaching. With a nice broadcasting gig with ESPN and ABC, Van Gundy can wait for the right opportunity to get back into coaching. 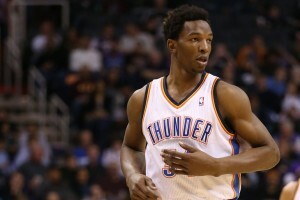 If both parties (the Thunder and Van Gundy) are interested, he could be possible candidate. 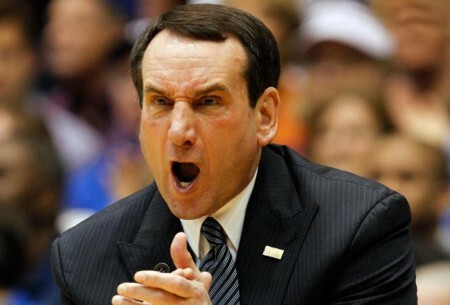 Mike Krzyzewski – Coach K is well on his way to being on the Mt. Rushmore of college basketball coaches. He just got done capturing his 5th NCAA championship this past season. For the past 10 seasons, he has been the head coach for USA Basketball, where he has coached Durant and Westbrook in international competitions. What if for a second, Coach K decides that there is nothing else he can accomplish in college basketball and would like to see what he could do in the NBA before it comes time for retirement. 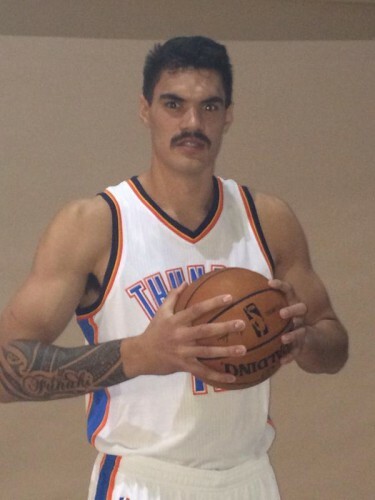 The Thunder vacancy would be the perfect opportunity of Coach K to pursue this. 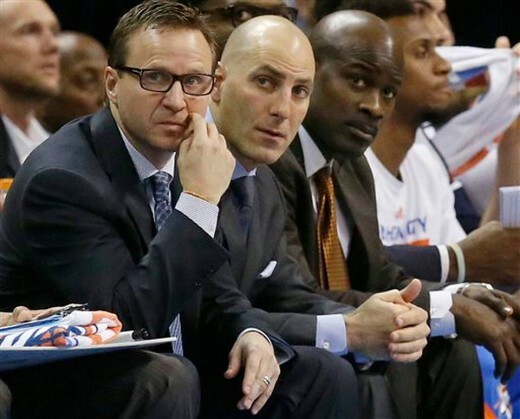 The Thunder coaching vacancy is one that should generate plenty of interest. 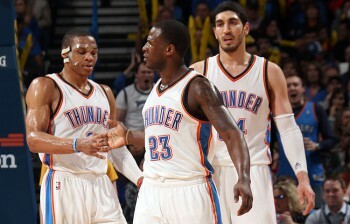 The opportunity to coach Durant, Westbrook, Ibaka, and possibly Kanter in their primes has to a dream for many coaches. As it stands right now, Donovan seems to be the front runner for the job. But if the Thunder still have not decided on a coach within the next two weeks, look for the Thunder to be leaning towards one of the coaches in the NBA circle. 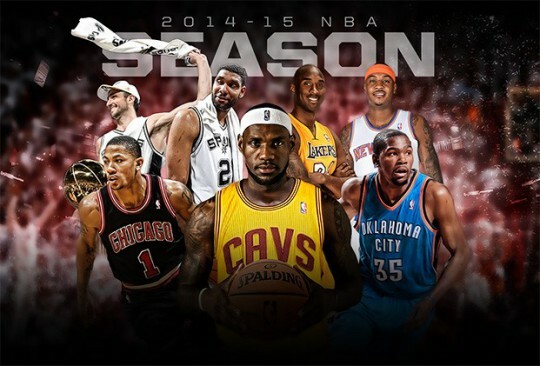 It’s a rite of passage every August to look at the newly released NBA schedule and predict the record of your team. It’s usually a losing battle as many of the variables that come into play during the season (injuries, trades, chemistry issues) have yet to come to fruition. But we are fans and this is what we do. I always like to look at an 82 game schedule in chunks; no less than 10 games and no more than 25 games. In that amount of time, patterns tend to develop, momentum can be built, and the foundation for a successful season can be established. 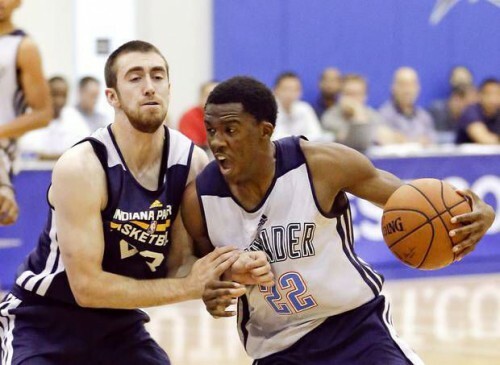 Unfortunately, as we saw with the Indiana Pacers’ second half last season, it can also work the other way around. 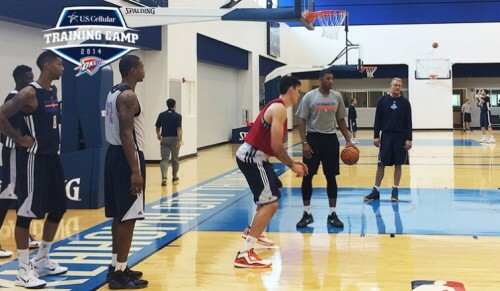 Here’s a look at the Thunder’s upcoming season in chunks. I guess I would much rather start the season road-heavy, than end it road-heavy. The Thunder’s first four road games are against teams that made the playoffs last season, while the one home game is against a wild card team. Denver is a mystery to everyone. With so many players coming back from injury, Denver could either surprise everyone in a Phoenix Suns-like revival or they could be the same inconsistent bunch we saw last season. 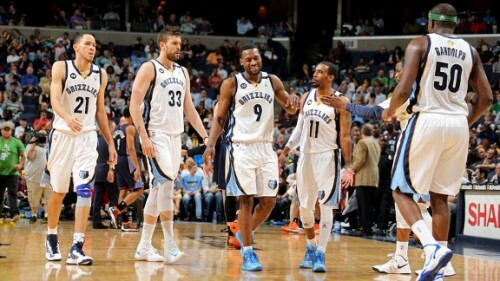 After those first five games, the Thunder host the team they dispatched in the first round last season, the Memphis Grizzlies. 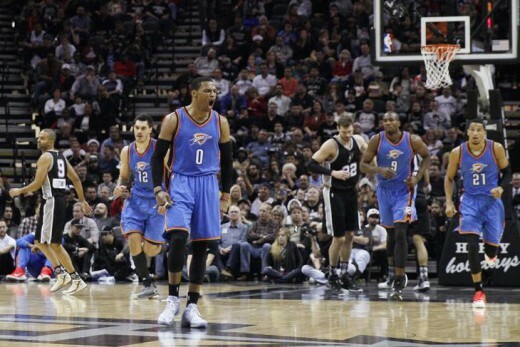 From there, it’s easy street as the Thunder face four lottery teams. Possible Trap: Three back to backs. 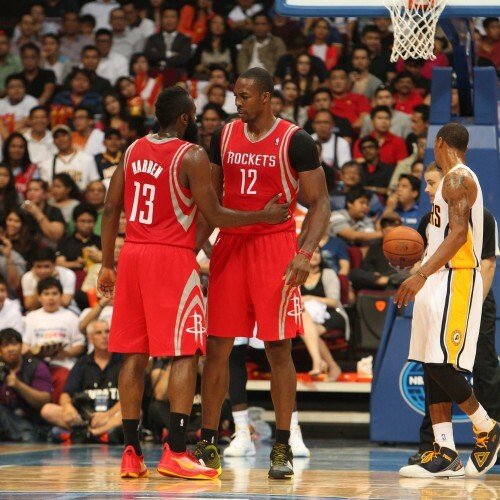 Houston’s depth (or as James Harden would call them “role players”) got depleted this offseason, but they still have Harden and Dwight Howard. After that, it’s a back to back roadie in the oxygen-deficient Rocky Mountains. 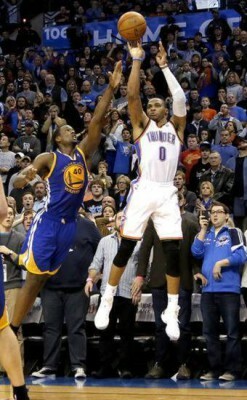 A four game homestand follows as the Thunder face the Golden State Warriors for the first time in the season. If you remember the first two meetings between these two teams last season, then you’ll definitely have your DVR tuned in if you aren’t at the game. After the homestand, there’s a three game road trip that features 3 lottery teams. Possible Trap: The Utah game between the Golden State and New York game. 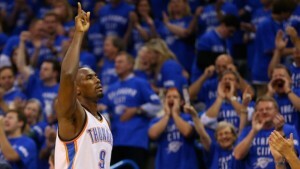 The prodigal son (LeBron James) makes his only regular season trip to OKC. How ironic is it the Thunder play James and the Cavs one game and then play Andrew Wiggins and the Minnesota Timberwolves the next? After that, it’s a 3-game West Coast swing that includes the Warriors and the Lakers. 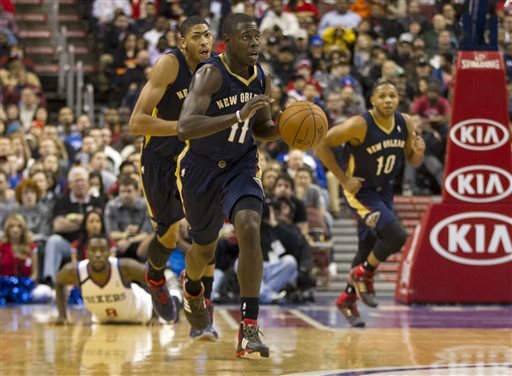 Finally, a sneaky difficult two game homestand follows against Anthony Davis and the Pelicans and the Trailblazers. Possible Trap: At Sacramento. The Kings are one of those teams yearning for respect. 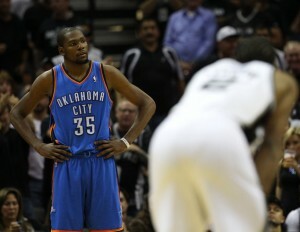 They always seem to play lights out against the Thunder at home. The toughest stretch of the season for the Thunder will probably be the 24 games from Christmas to the All-Star break. It was during this time last season, with Russell Westbrook recovering from his third knee surgery in 8 months, that Kevin Durant solidified his status as an MVP candidate. 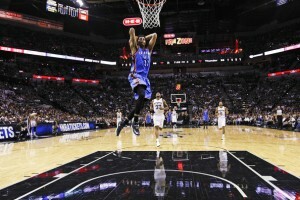 He led the Thunder on a 19-7 tear, against some of the top teams in the league, that had Oklahoma City heading into the All-Star break with the league’s best record. The 24-game stretch can be broken down into two stretches: a 10-gamer and a 14-gamer. The 10-game stretch, from December 25, 2014 to January 16, 2015 features a tough, even-keeled run (five home, five away) against 7 playoff teams (and Phoenix). 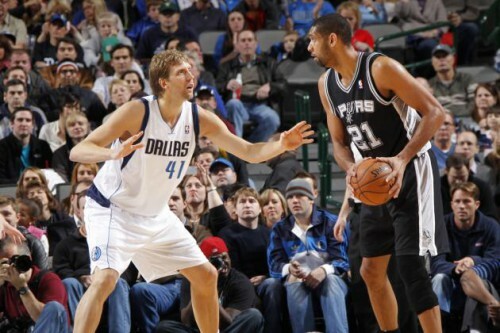 It starts with the Western Conference Finals rematch on Christmas against the Spurs in San Antonio. 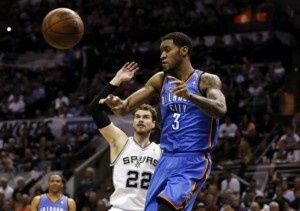 The next night its back to OKC to face the Charlotte Hornets. 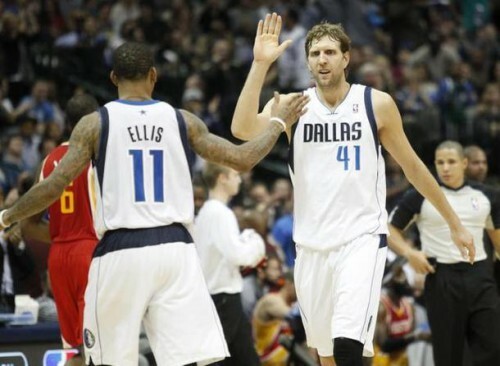 Two night later, it’s down to Dallas for a tussle with the Mavs. And then back home to face the Phoenix Suns to close out the year. 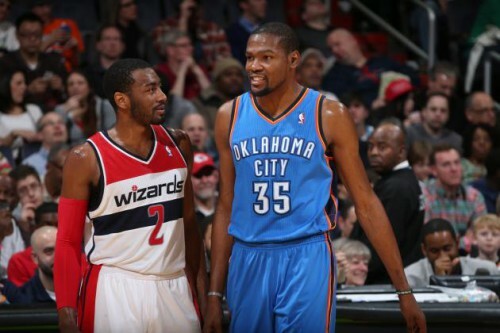 The year begins with a home game against the Washington Wizards…you know, the team Thunder fans will be hearing about in their nightmares for the next two seasons. 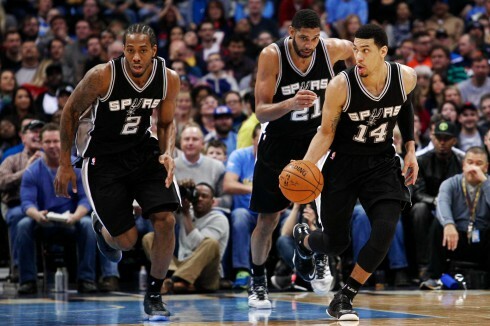 After that its back on the road to face the Warriors. The 10-game stretch finishes with the Rockets and the Warriors (again). Side note: It feels like we play the Warriors 10 times this season. The 14-game stretch that follows is probably more difficult because 9 of the 14 games are on the road, including a 5 game Eastern Conference romp. Of the 9 road games, four are against playoff teams from last season, one is against Cleveland, and another is against the mercurial Knicks. Of note on the road games, is one against Washington (yeah, that team again), where the Thunder have not won since the 2010-11 season. Washington DC has become a house of horrors for the Thunder of late. Possible Trap: All the road games in a short time span. 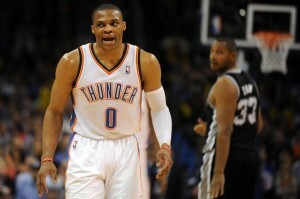 After a week long All-Star break, the Thunder start the second half of the season at home against the Mavericks. 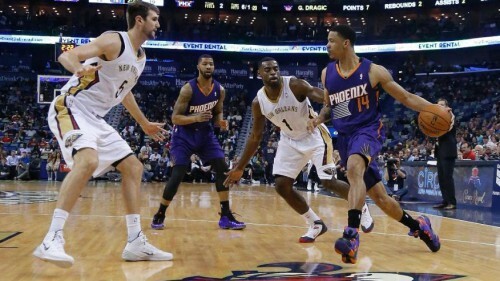 They then travel to Charlotte to play the Hornets, and then return home the next night to play Denver. Oklahoma City is lucky in that they don’t have to make transcontinental treks on road trips, but they also suffer with these weird road/home back to backs that take them to one coast and then back home. After another home game (Indiana), it’s back to the West Coast to face Phoenix, Portland, and the Lakers. After a home reprieve (Philadelphia), it’s back on a plane for a prime time match-up against the Bulls in Chicago. In this stretch, the Thunder play 8 of their next 9 games at home, while the road game is in Dallas (a one hour plane ride). Six of the nine opponents are playoffs teams, so it is by no means an easy stretch. It is also a non-tiring schedule, that features only one back to back. If there was ever a time in the schedule for the Thunder to either gain a little ground, or put some space between themselves and those teams under them, this would be it. The final 11 games of the season features 6 road games and 5 home games. 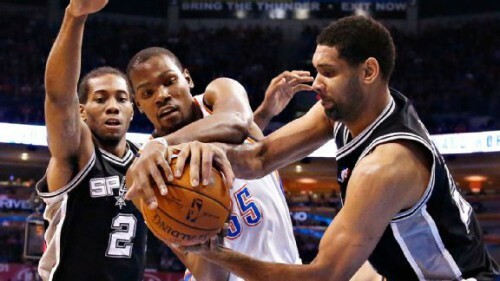 In the last couple seasons, the end of the regular season has been road heavy for the Thunder. This season’s home heavy finish is a good reprieve from previous seasons. The Thunder play San Antonio twice during this stretch, so first place in the Western Conference may be up for grabs in these last few weeks of the season. 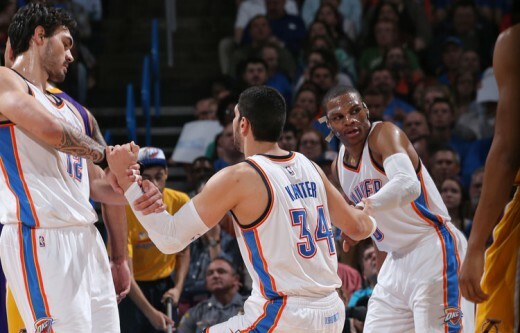 The Thunder play the Texas trio at home during this stretch, while playing Phoenix and Memphis on the road. 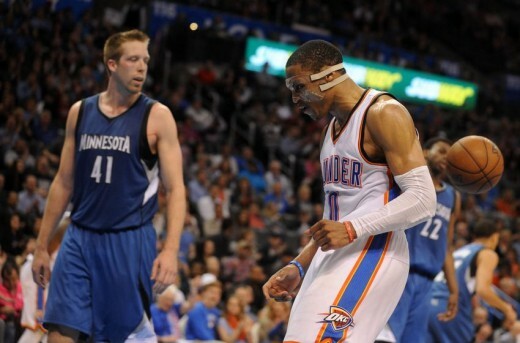 They finish the season in Minnesota, which may be important if the Thunder are still battling for a seeding. 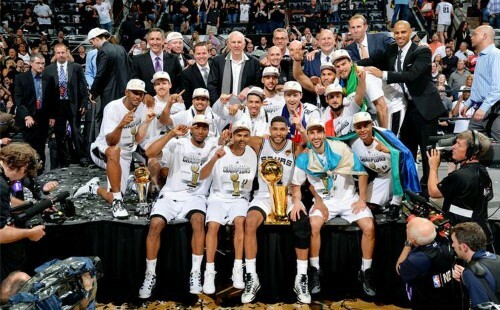 NBA champions!!!!! You heard it here first. All in all, the schedule is pretty balanced. While the Thunder do play a lot of good teams (partly because they are in the Western Conference), there is a lot of time for rest, which should aid the Thunder in the playoffs.